Until Friday before Easter I worked like a madwoman to get an application off. I was immensely tired on the packing and planning of our trip, but we got off in time. Saturday at 10! Augustus in my car, Sanne and Rita in my other green car, dogs all over the place. 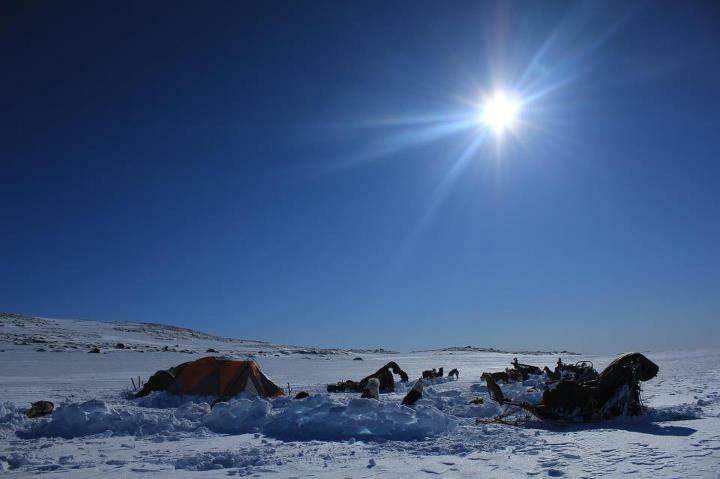 Sleds, food, tent. You name it! Met up with Thor & the gang (Tone & her friend) at Fagerheim after cancelling the second plan – wind warning first of all – and left the parking with five teams, 8-6-6-5-4 dogs. Ok conditions until we reached our destination, a little stone cabin south of Hein. This place became our home for 28 hours of gale. 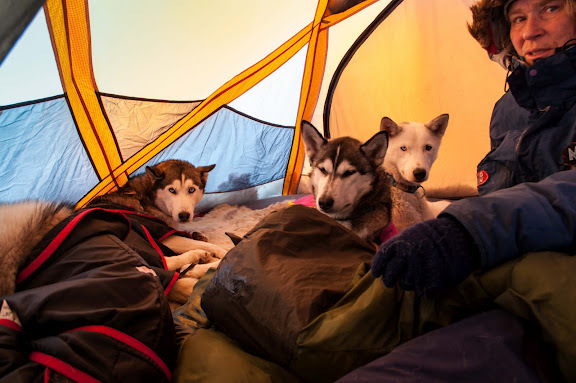 We had good tents, the dogs got cold. I spent the second night in the cabin with 4 dogs, I sleep poorly to the sound of possibly tent ripping winds. Getting dressed well next morning, I fell into the creek fetching water and got wet all over. Thanks to my fear of colds: I had spares of EVERYTHING! My Nesna Lobben boots are not YET dry! A week later! A good day of mushing past both Raudhelleren and Lågaros, but no stopping. Thor chased mini-huts. This one was all snowed down, but a team of scooters came and emptied it for most of the snow. We camped near it though. I prefer tents, and the wind slowed down too. Changed wind for cold: minus 19 or so? Beautiful crisp sunshine and mushing on via Sandhaug to a flat and sheltered, but cold flake. I do like hot beverages and Drytech food for simple living. Dogs enjoyed meat. I had a new down parka, so felt warm despite the frost. Augustus is a good tent raiser. I dig out snow blocks for tent and dogs. Mushing on we saw Sheri and finse at the distance, accompanied by a friend and another dog – now 32 dogs altogether. The girls enjoyed knitting in the doorway, Thor offered beers, and I ran up and down hills to get cell coverage. The next day was the last mushing day for Augustus and me, we went back to fagerheim and chatted with Inger marie and ralph before we headed to Hemsedal. Mushing in to the cabin with 4 sacks of firewood and no snow on the trail was interesting too. In the cabin we found Rita and Sanne plus a dog, and my son plus three kids, and my brother with 3 young adults and his wife. A lamb steak was already roasted. Three days with kamikaze mushing on a frozen riverbed, skiing lessons for 3 & 5 year olds, and content dogs. Ski competition with campfire, hotdogs, wine tasting and fun runs on small sleds with neighbours on Easter Evening. And easter 2012 was over!